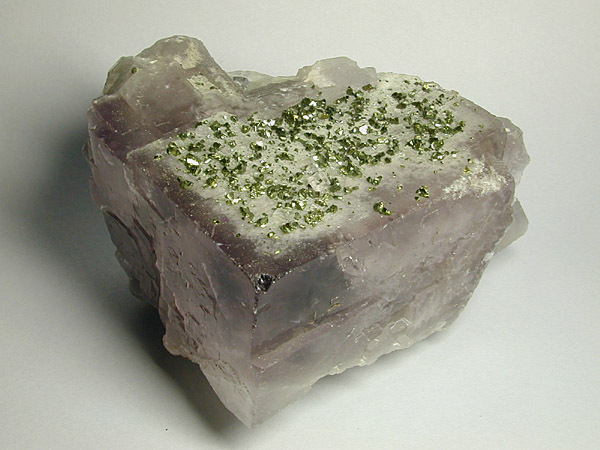 A well defined reflective cube crystal face of Fluorite with a scattering of tiny clear double terminated Quartz crystals. 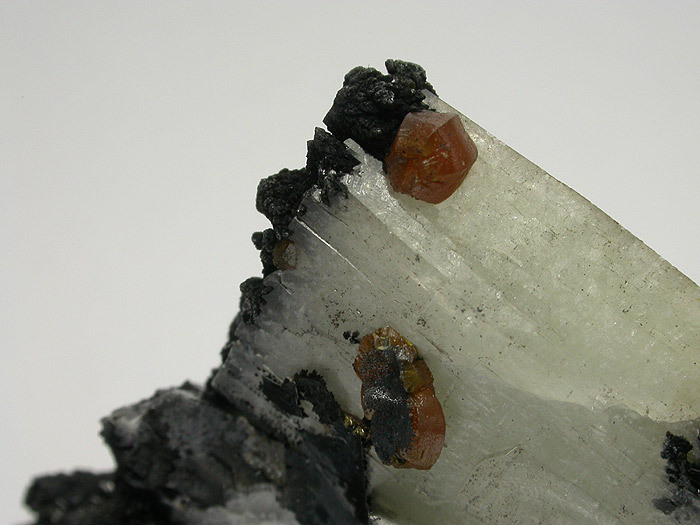 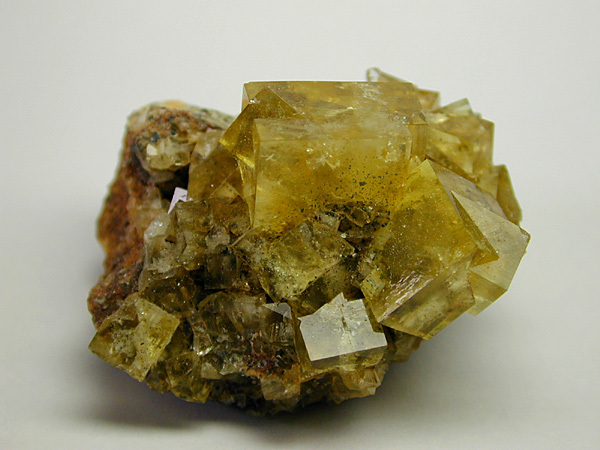 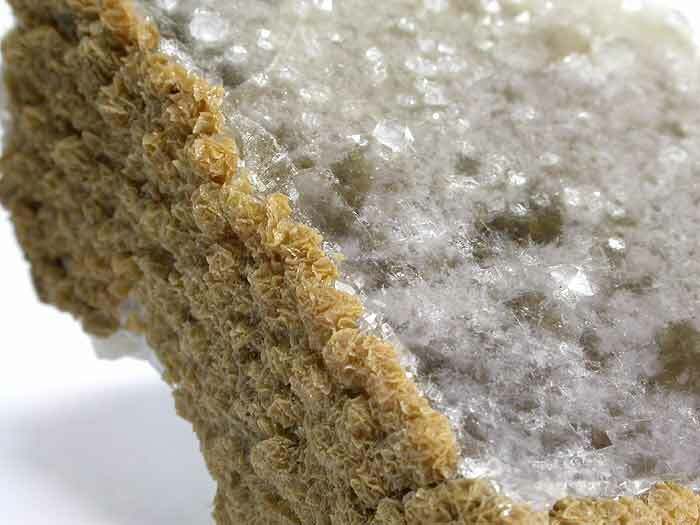 The Fluorite is attached to another smaller piece of Fluorite to one edge and there is a coating of preferentially deposited, small buff coloured intergrown saddle shaped crystals of Siderite on two edges of the main crystal. 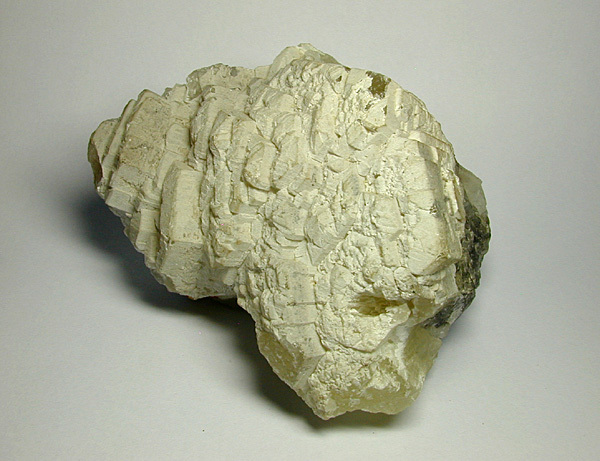 A nice example from the locality. 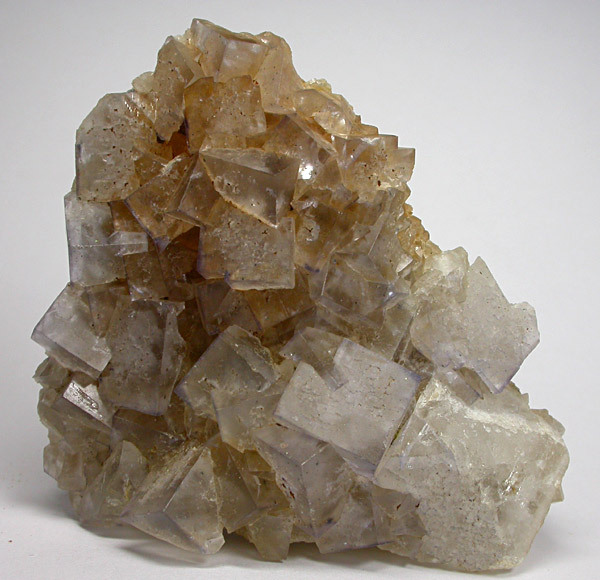 Dimensions 96mm x 68mm x 28mm Appx. 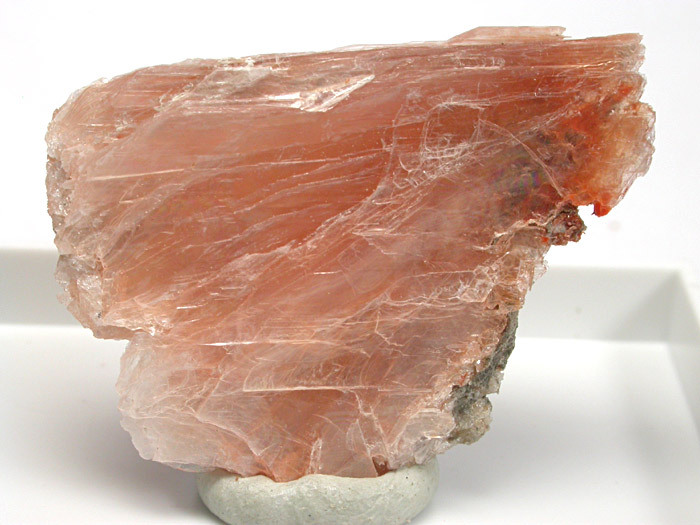 Largest crystal 60mm on edge appx. 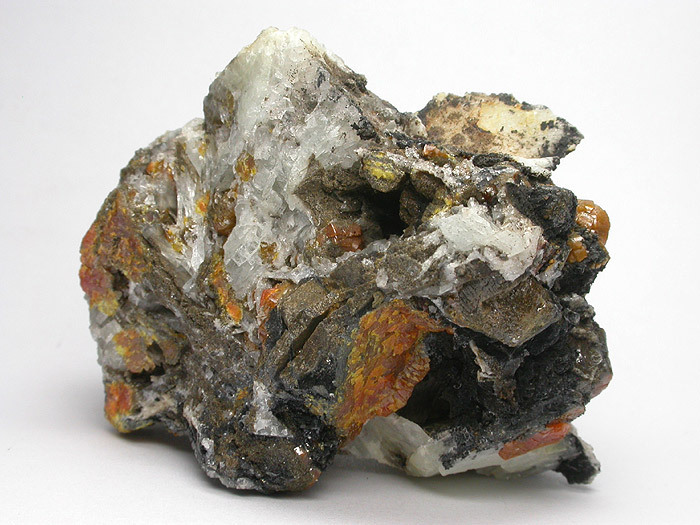 Origin (Locality) Boulby Mine, Loftus, Redcar and Cleveland, North Yorkshire, England. 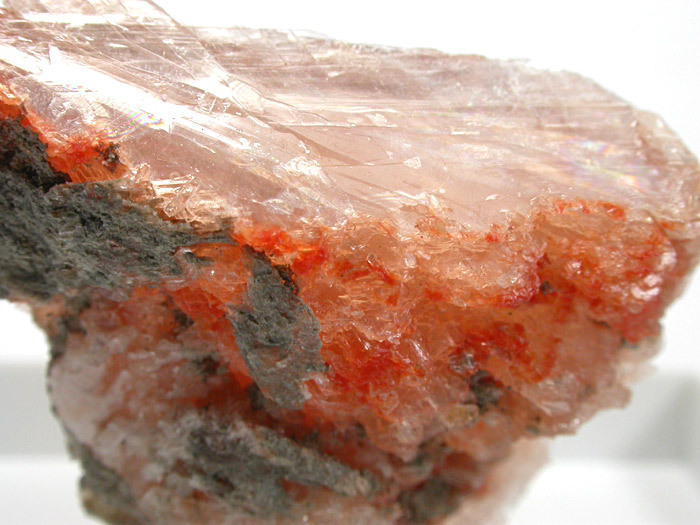 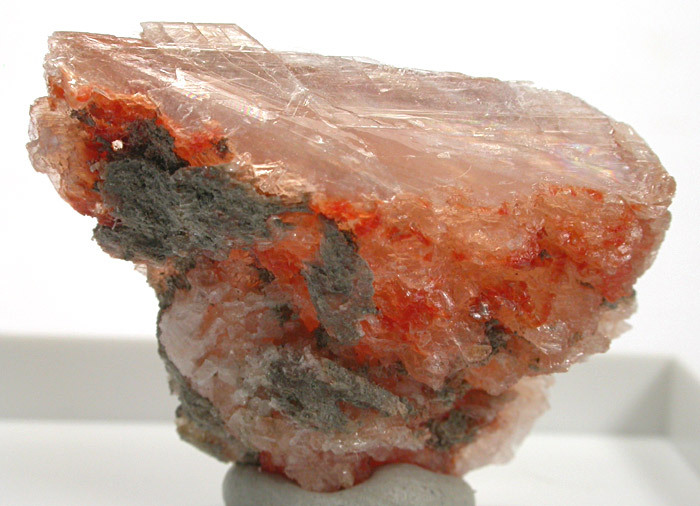 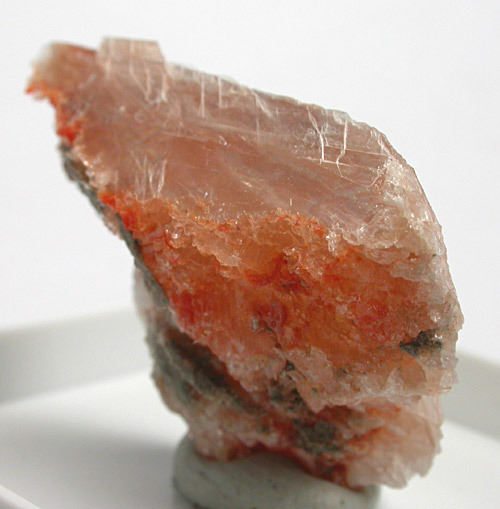 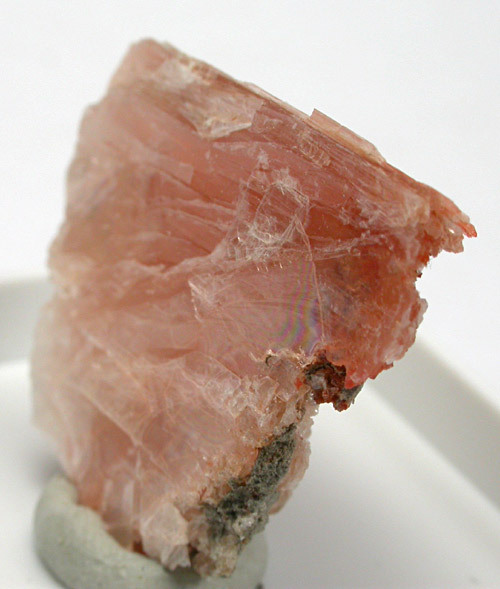 Description A salmon pink cleavage specimen of this uncommon borate. 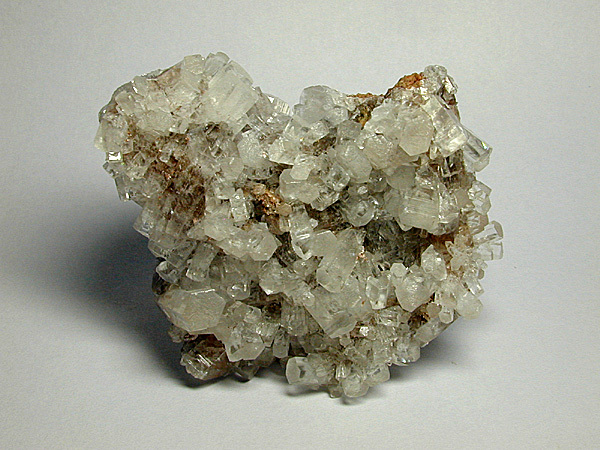 Dimensions 25mm x 18mm x 6mm Appx. 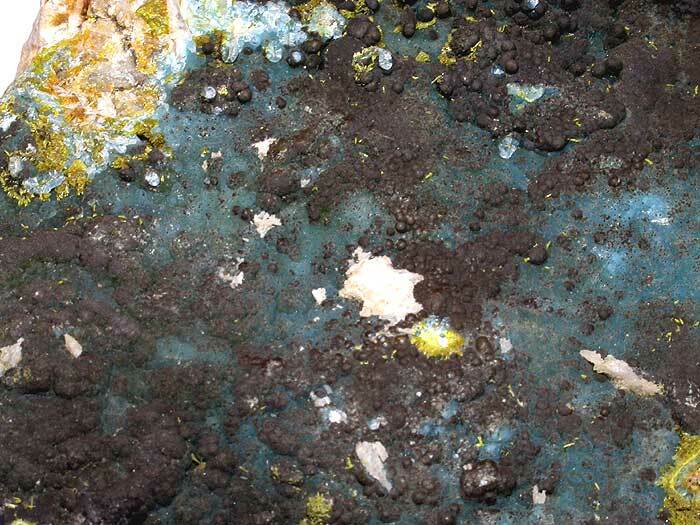 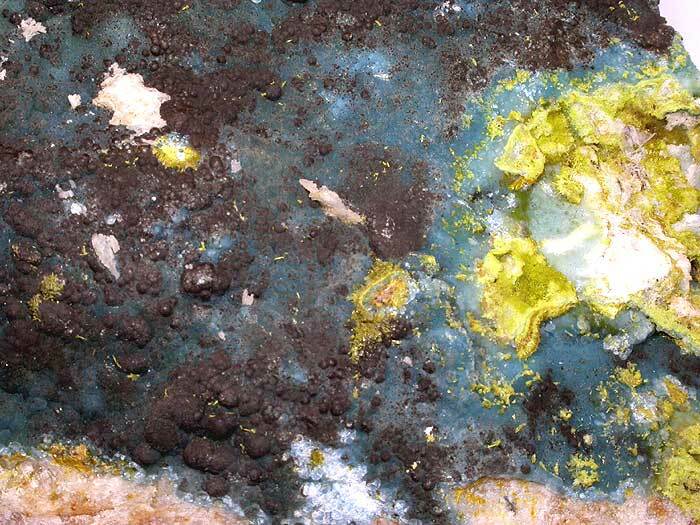 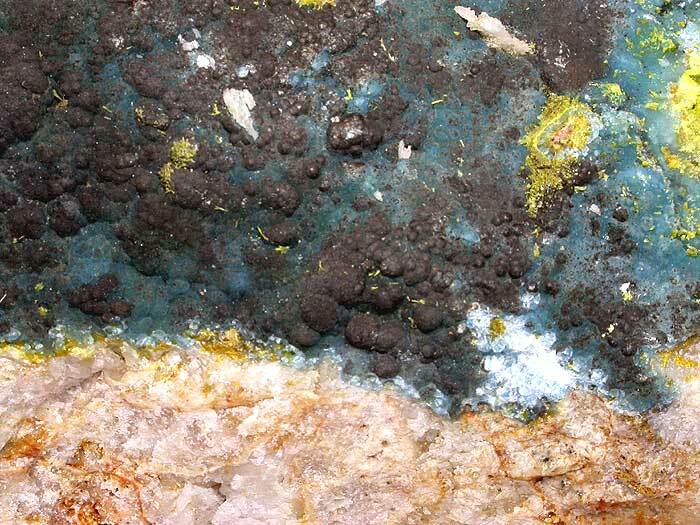 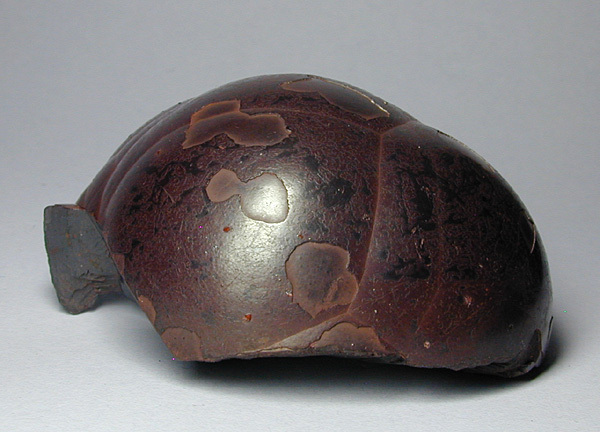 such that this colour is best seen when the specimen is viewed from the sides at a shallow angle. 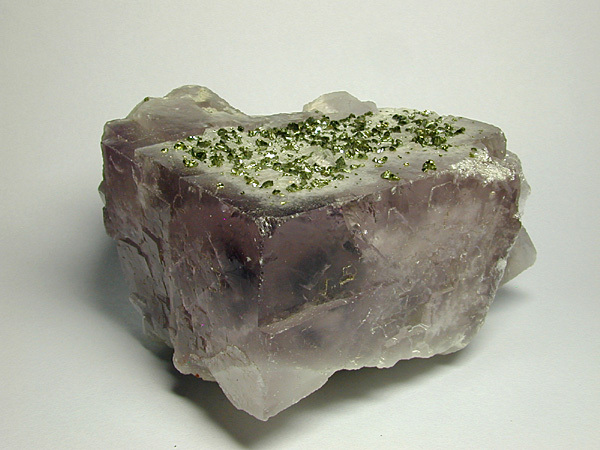 A great example of Fluorite from a less well known locality. 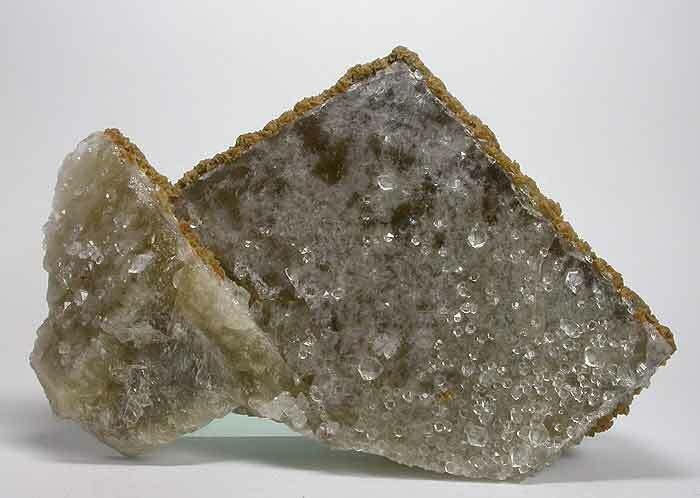 Dimensions 83mm x 68mm x 36mm Appx. 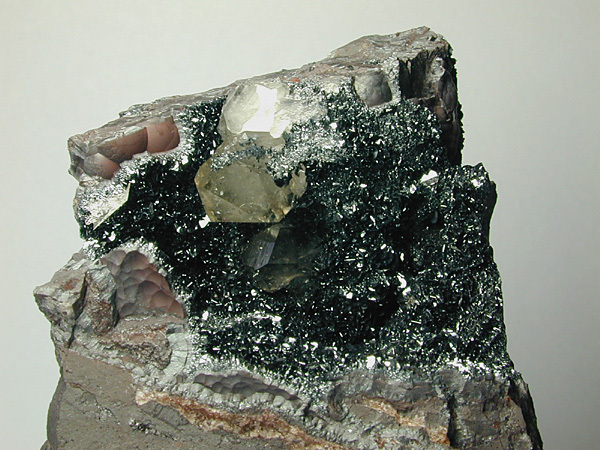 Origin Dry Gill Mine, Caldbeck Fells, Cumbria, England, U.K.
A large and fine example from the classic locality of Caldbeck Fells, Cumbria in the UK. 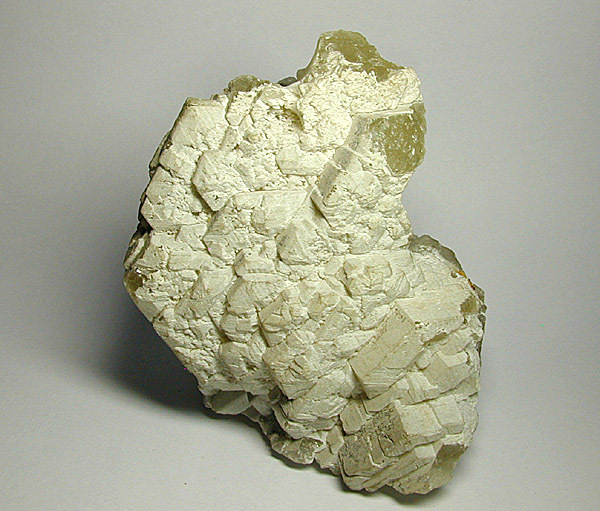 Dimensions 16.0cm x 14.5cm x 6.0cm Appx. 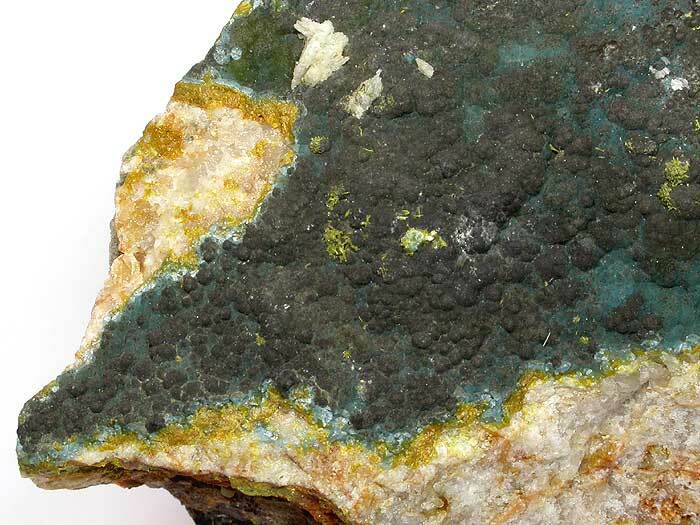 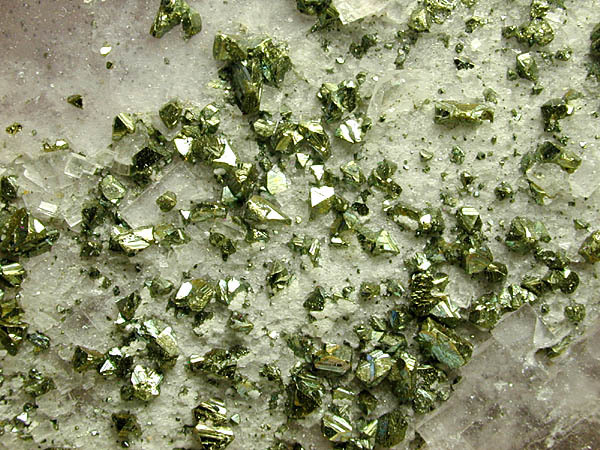 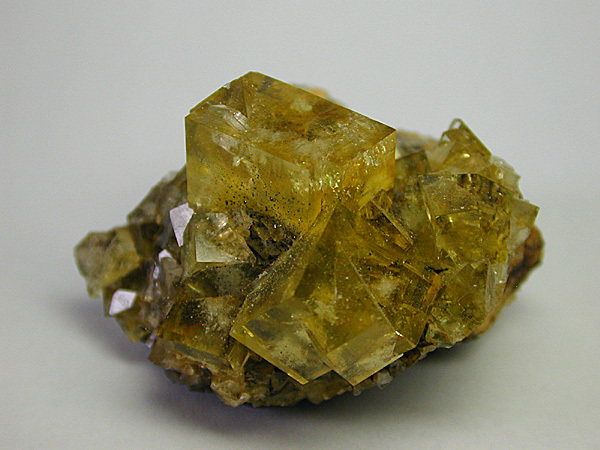 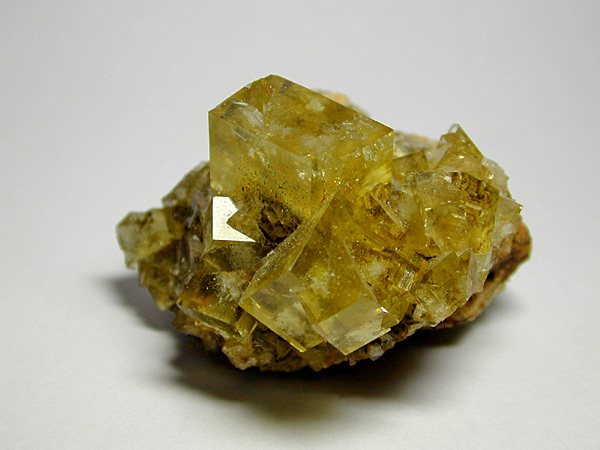 Material Mimetite (var. 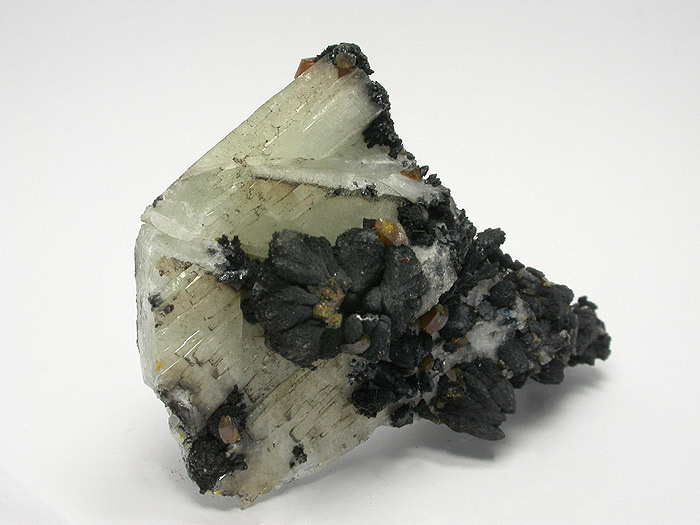 Campylite) with Baryte. 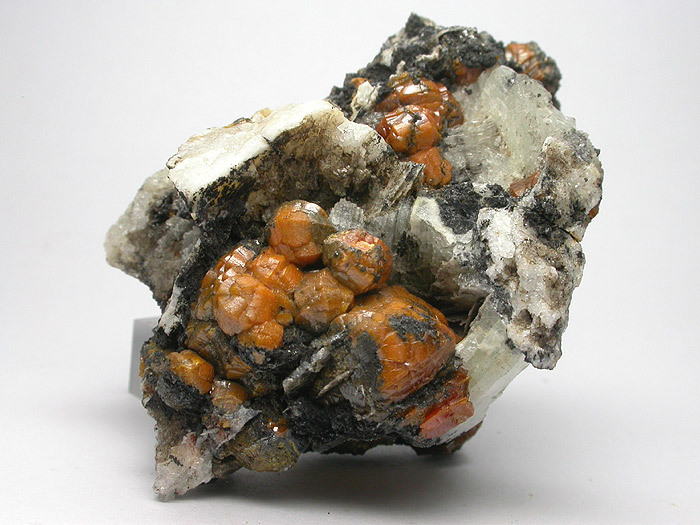 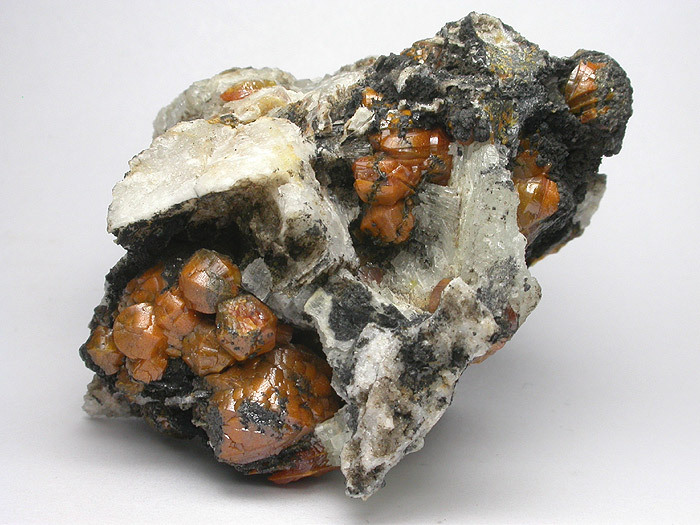 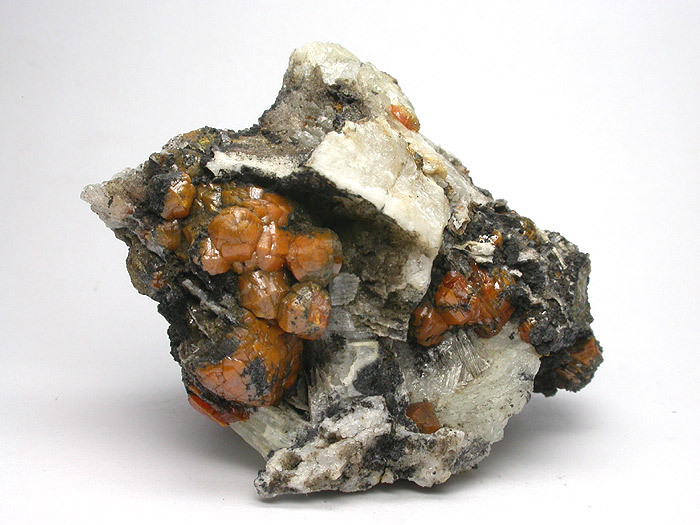 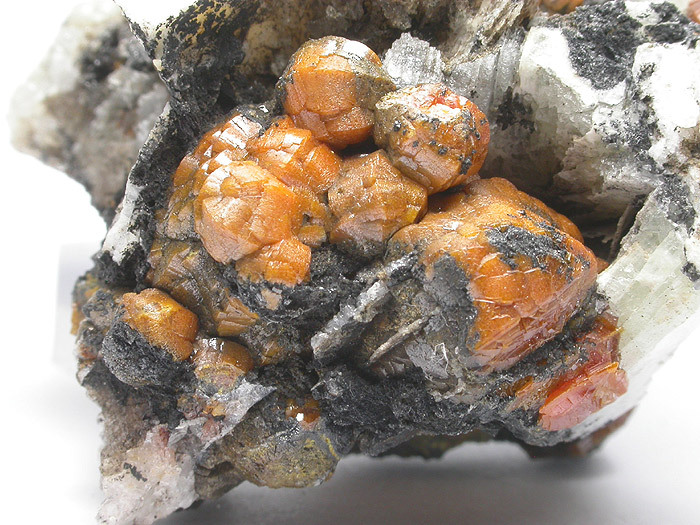 Description Rich clusters of bright orange barrell shaped crystals of mimetite (var. 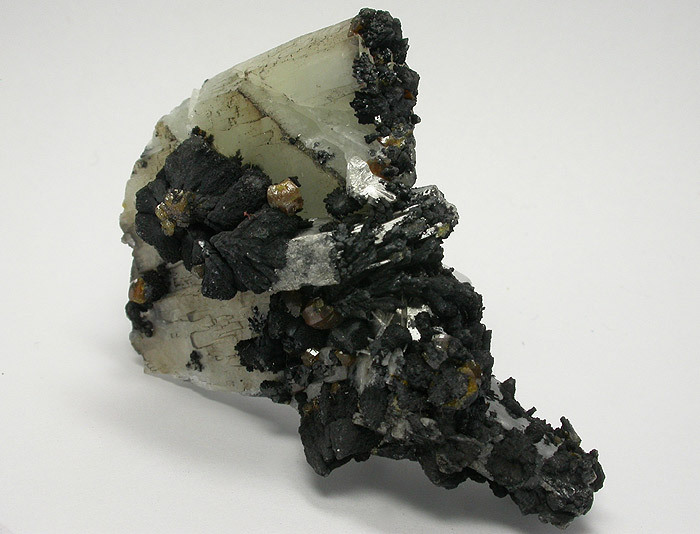 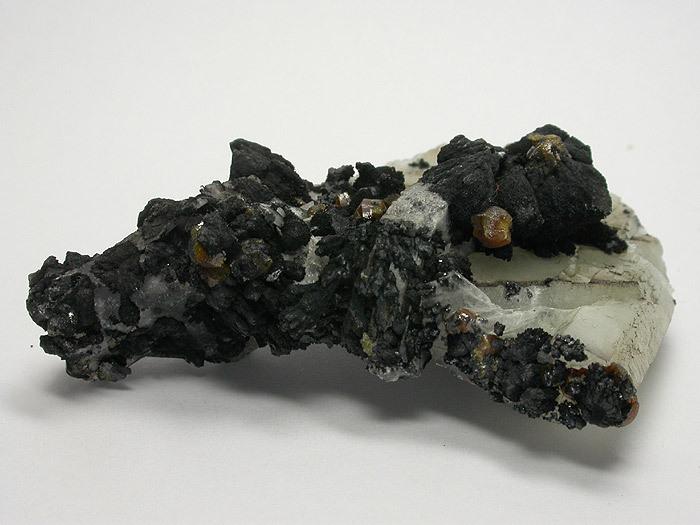 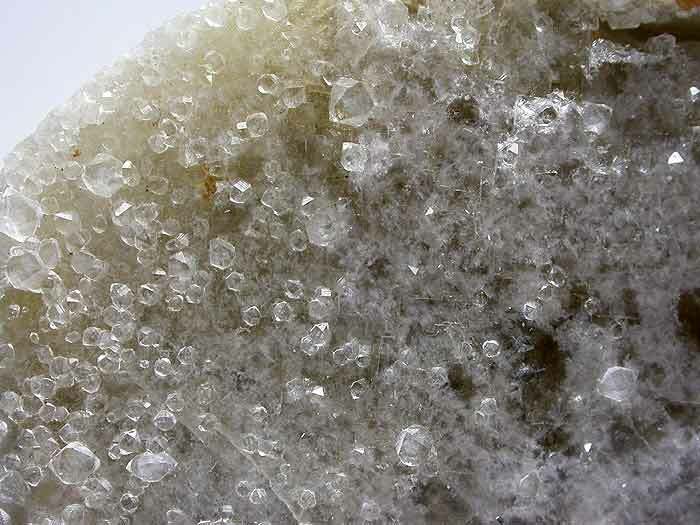 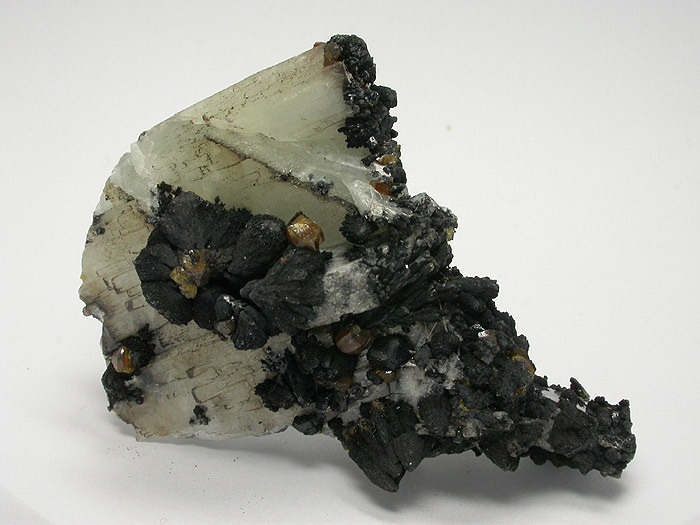 Campylite) intergrown and lying in cavities defined by white blades and masses of Baryte and dark grey masses of manganese oxides and a little Quartz. 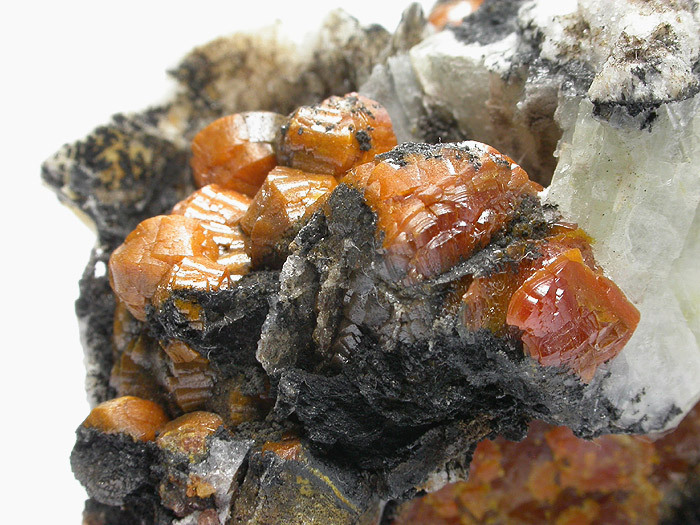 A great example from this classic location in Cumbria. 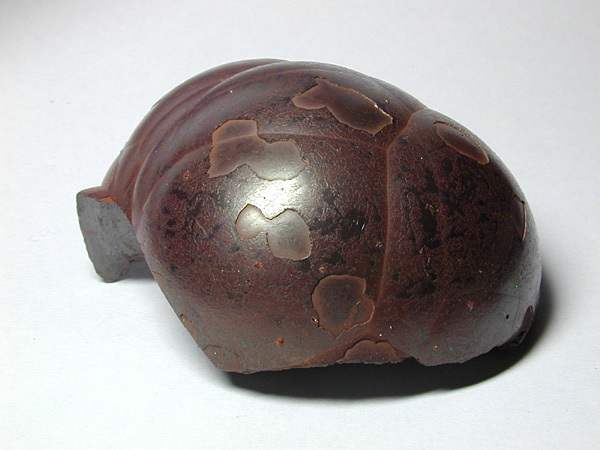 Dimensions 62mm x 42mm x 40mm Appx. 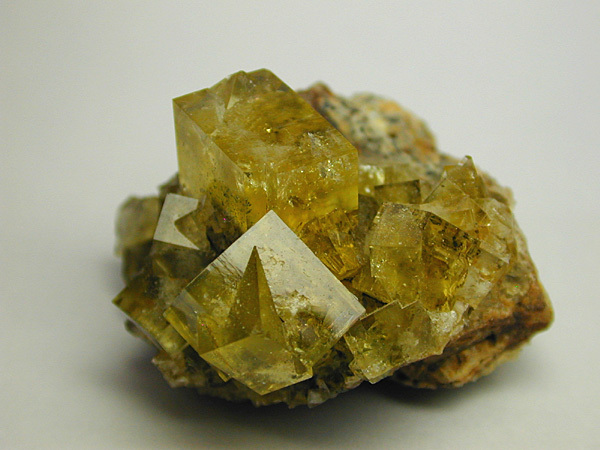 Material Mimetite (var. 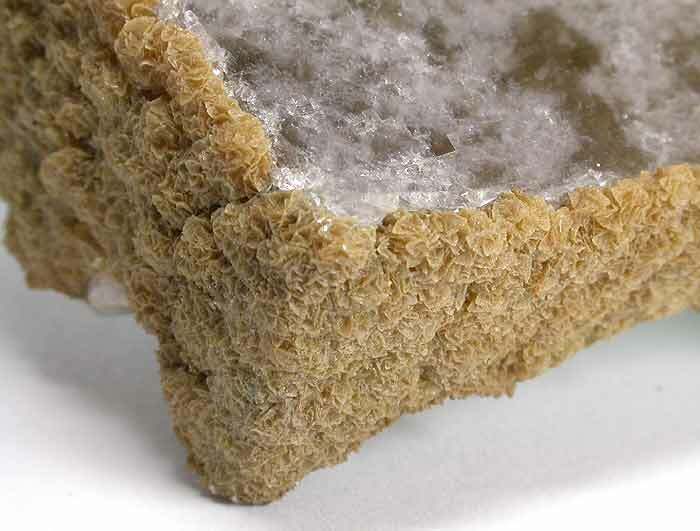 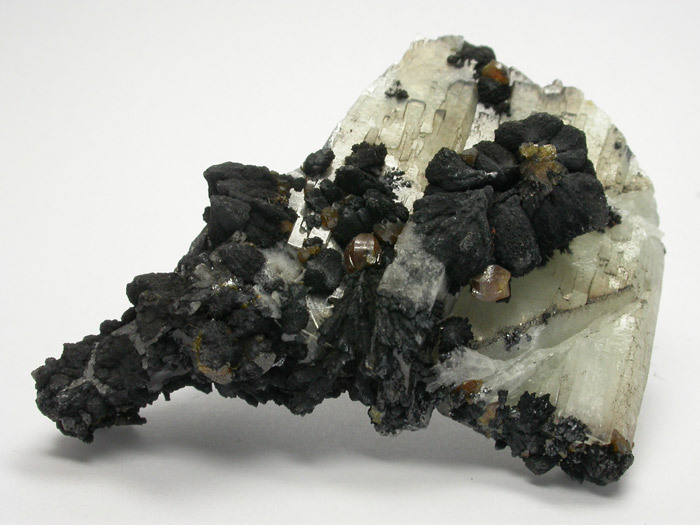 Campyllite) on Baryte. 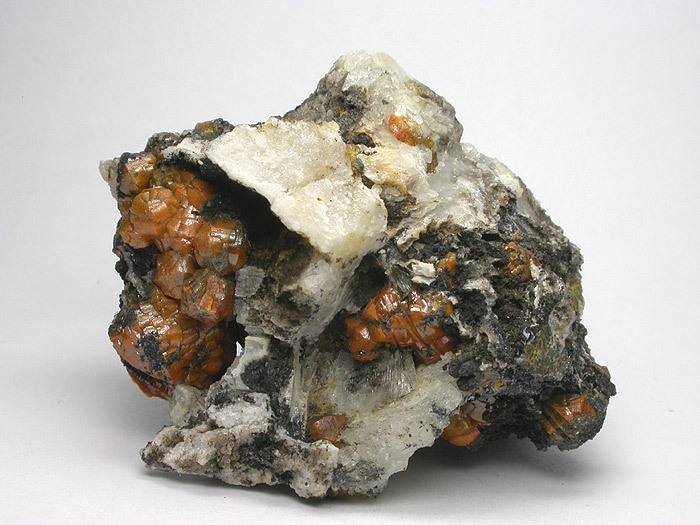 Origin Dry Ghyll Mine, Caldbeck Fells, Caldbeck Fells, Cumbria, England, UK. 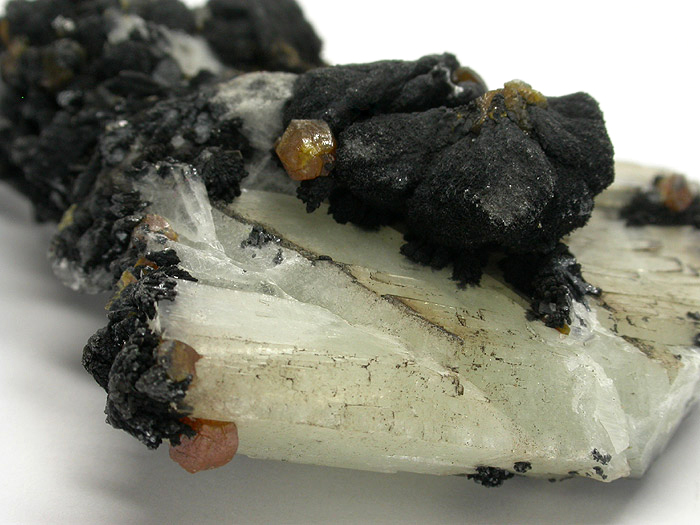 Description A single large blade of white to grey Baryte with another smaller one attached largely coated with black manganese oxides (possibly Coronadite) with a few small scattered caramel coloured barrel shaped mimetite Var. 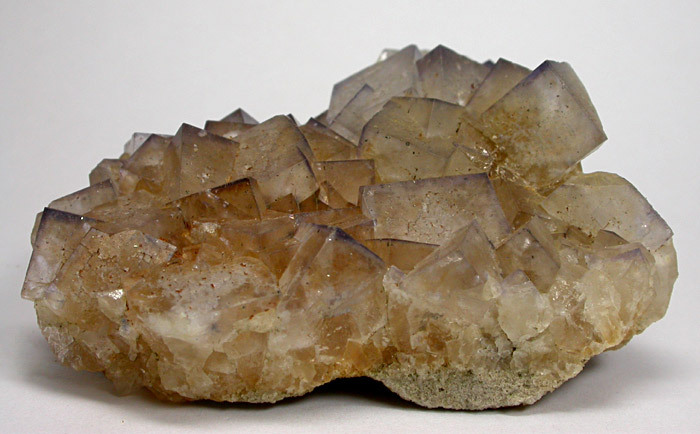 "Campylite" here and there. 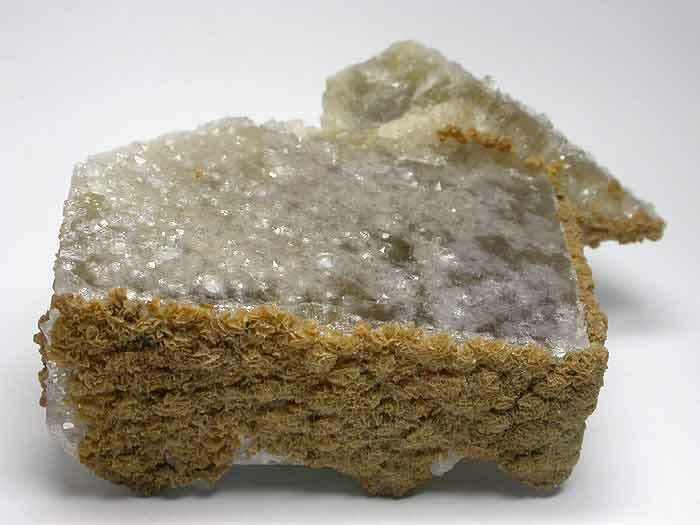 A great example worthy of any high quality mineral or crystal collection. 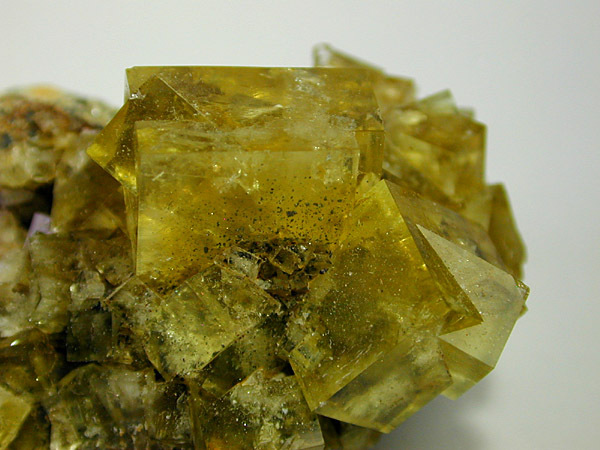 Dimensions 59mm x 45mm x 18mm appx. 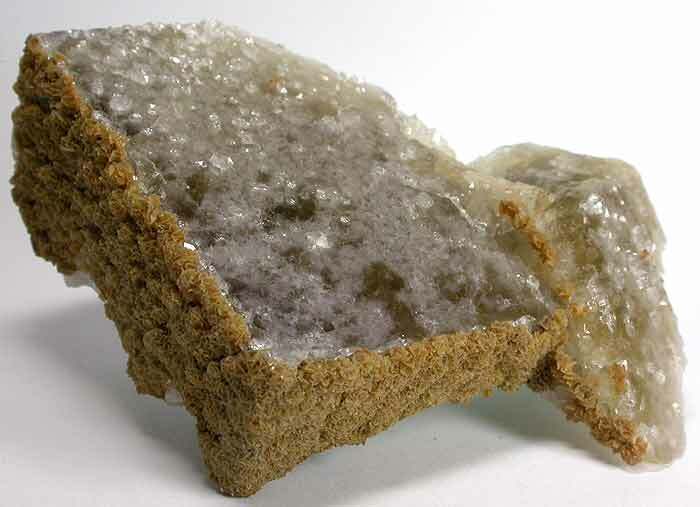 Largest crystal Largest crystal: Baryte - 30mm appx., Campylite - 4mm appx. 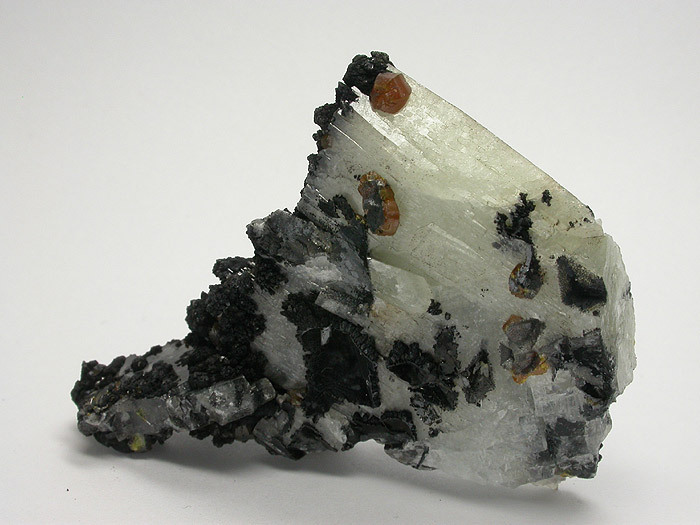 Origin Florence Mine, Egremont, Cumbria, England, U.K. 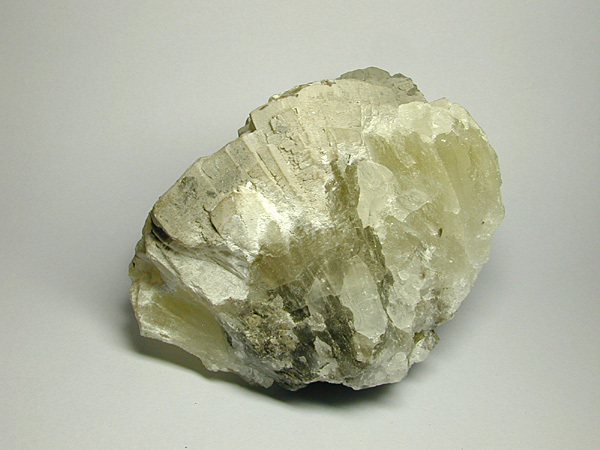 Description Nice small example from classic British Locality. 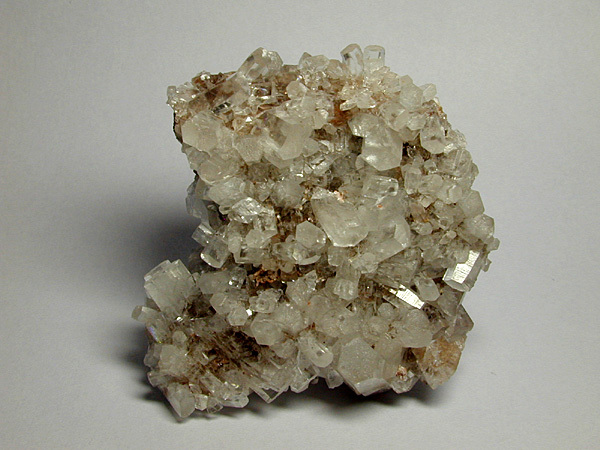 Dimensions 50mm x 40mm x 25mm Appx. 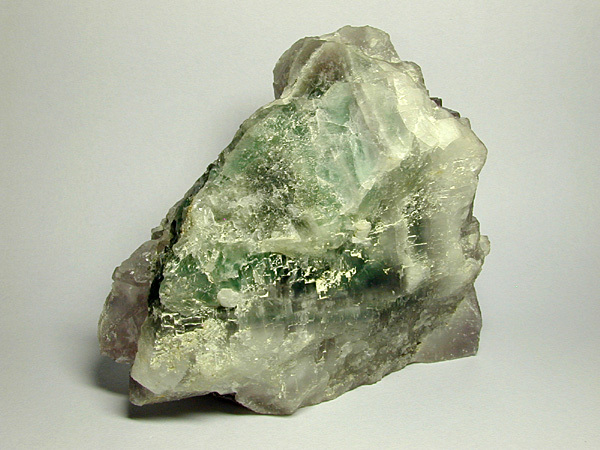 Fluorite from Hilton Mine, Cumbria, England. 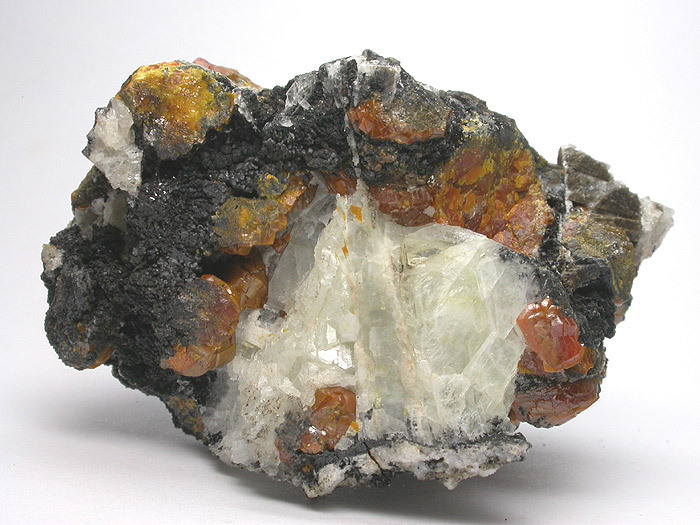 Origin Hilton Mine, Scoredale, Cumbria, England, U.K. 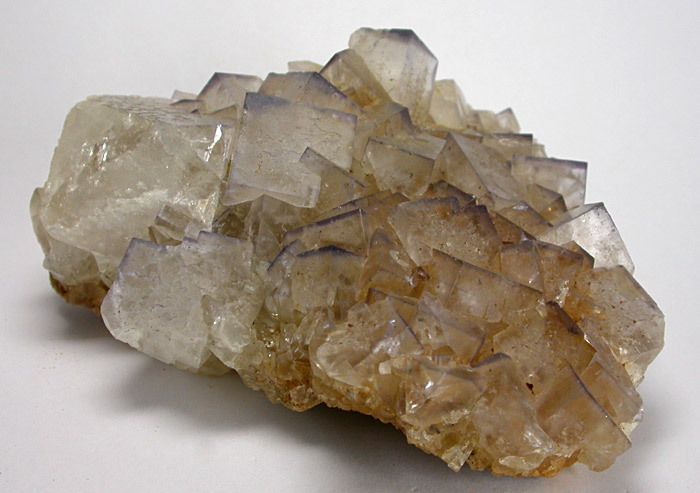 Description Nice small group of clean pale yellow transparent to translucent crystals on matrix. 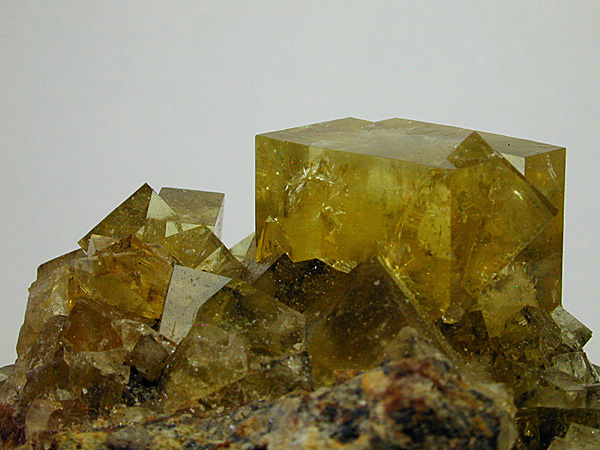 The largest crystal being more rectangular than cubic in shape. 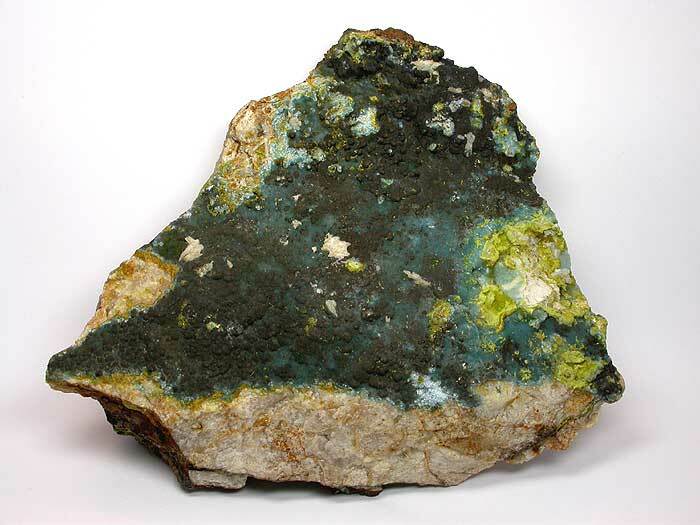 Good example. 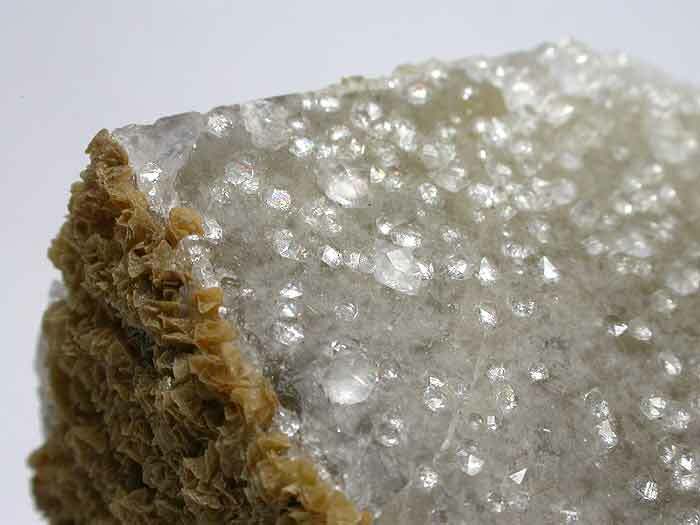 Dimensions 40mm x 40mm x 30mm Appx. 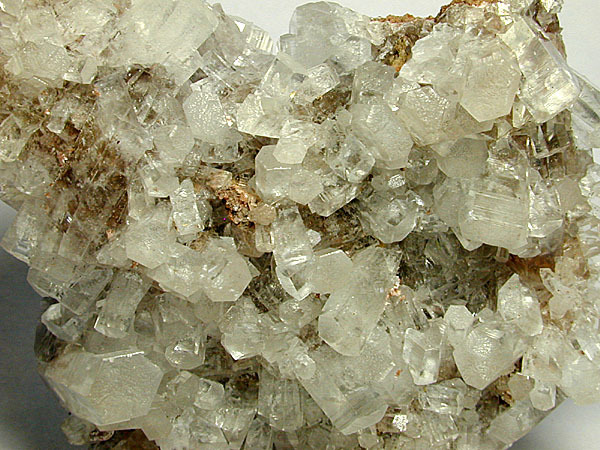 Largest crystal 16mm x 9mm Appx. 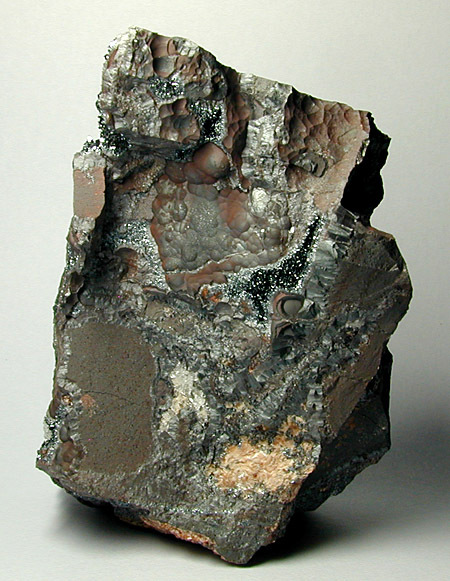 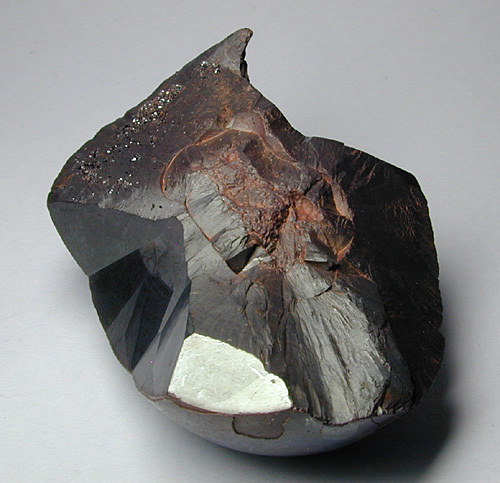 Hematite (var. 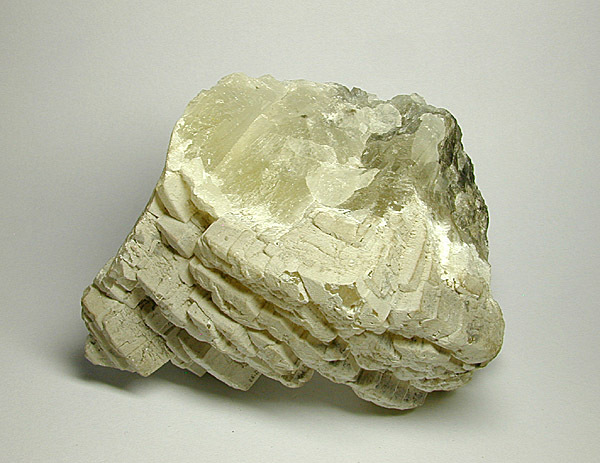 Specularite) with Quartz from Cumbria. 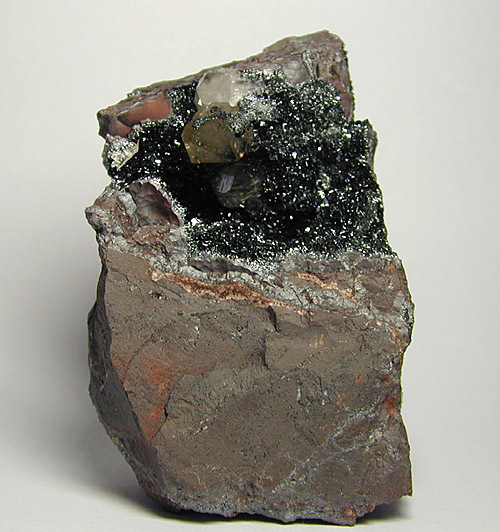 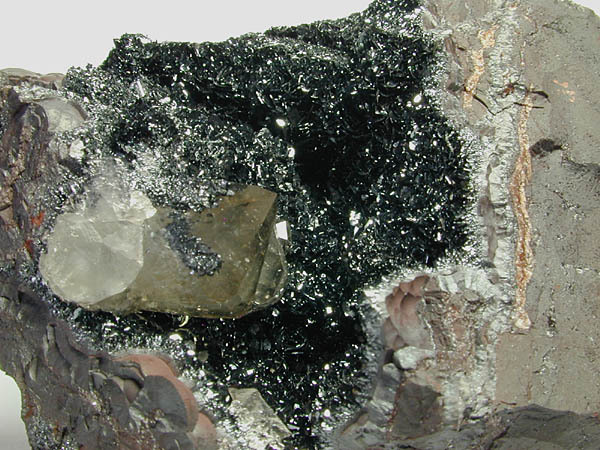 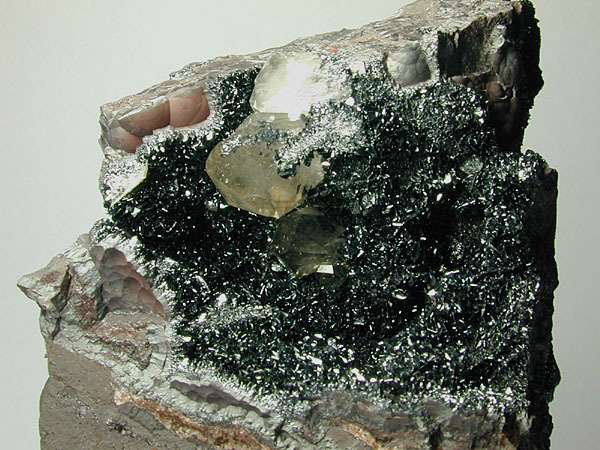 Material Hematite (variety "Specularite") with Quartz. 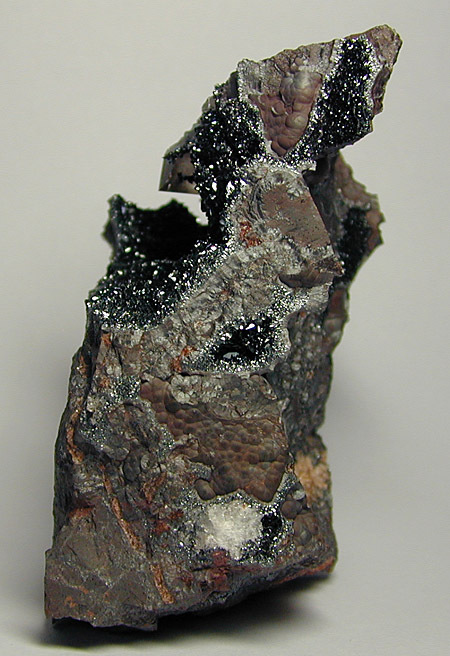 Description Free standing small display specimen showing lustrous metallic interlocking black blades of specular hematite lining and filling a cavity in massive hematite. 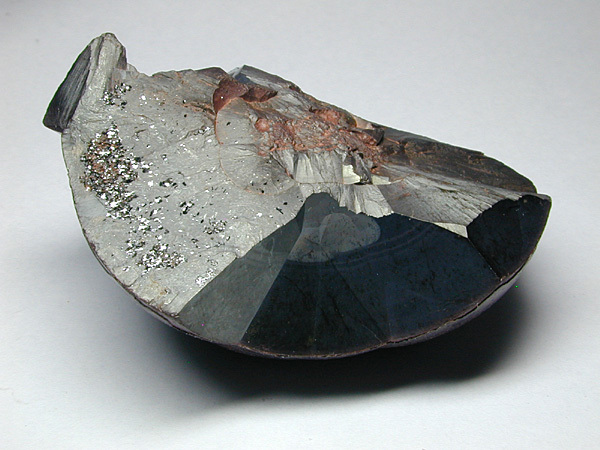 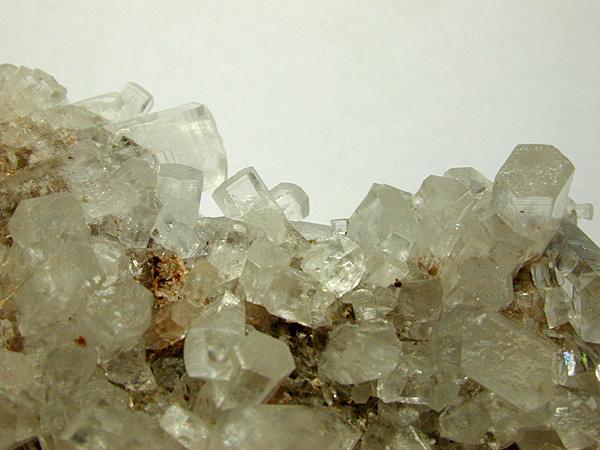 Two pale smokey quartz crystals also within the cavity. 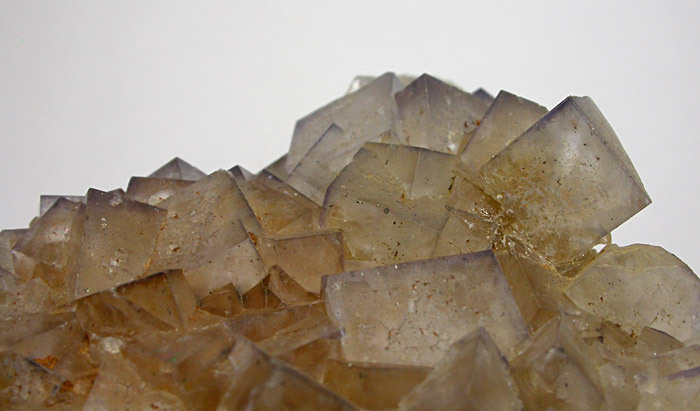 Dimensions 75mm x 50mm x 35mm Appx. 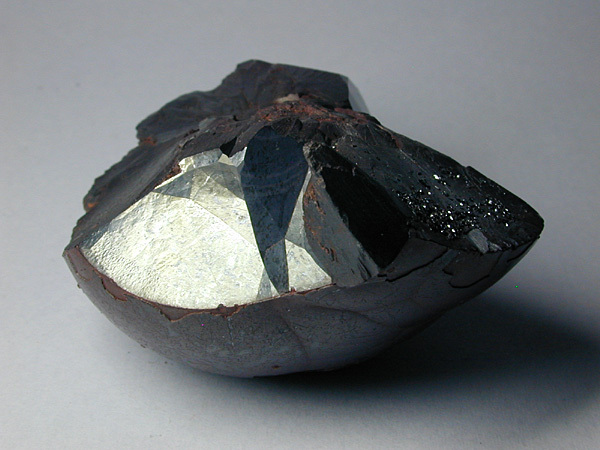 Largest crystal Hematite crystals: 2-3mm appx., Quartz: 9mm appx., Cavity dimensions: 40mm x 25mm appx. 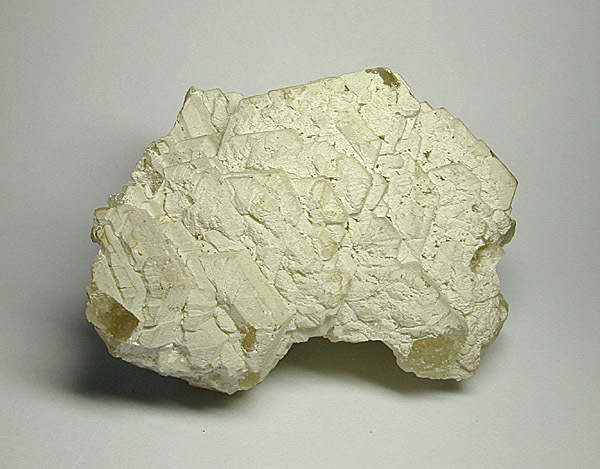 Witherite with Baryto-Calcite from Cumbria. 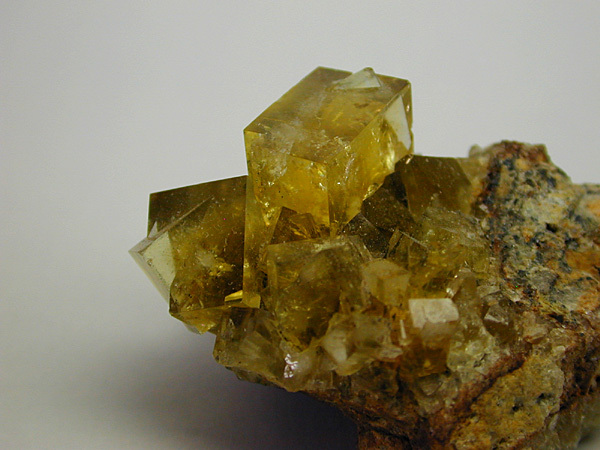 Origin Nentsberry Haggs Mine, Nent Valley, Alston Moor District, Cumbria, England, U.K. 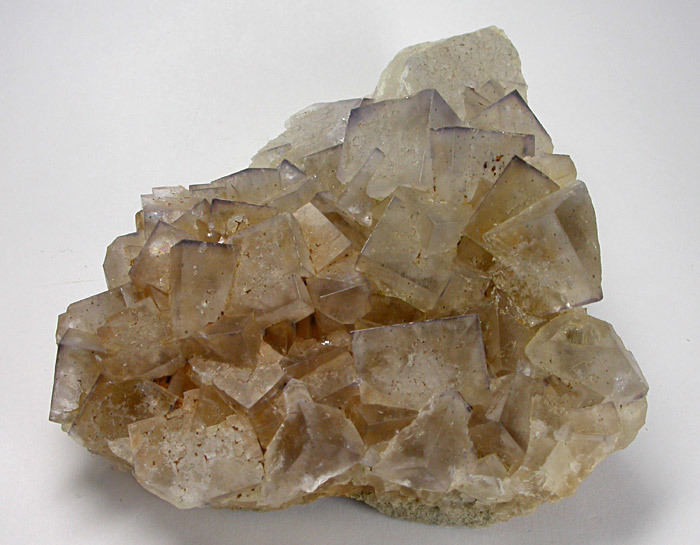 Description A cluster of parallel grown hexagonal terminations of near white witherite from classic English location. 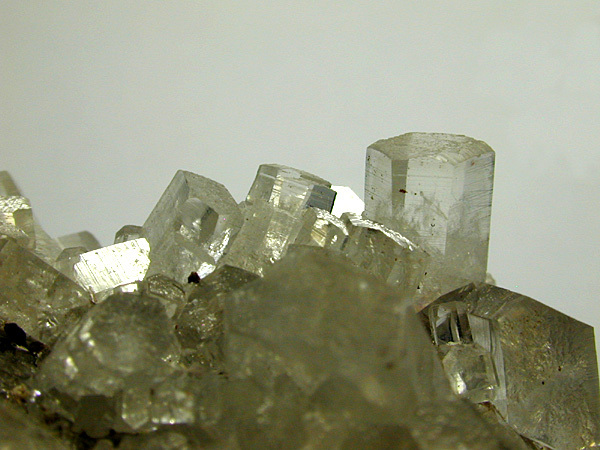 ex D.Hacker collection. 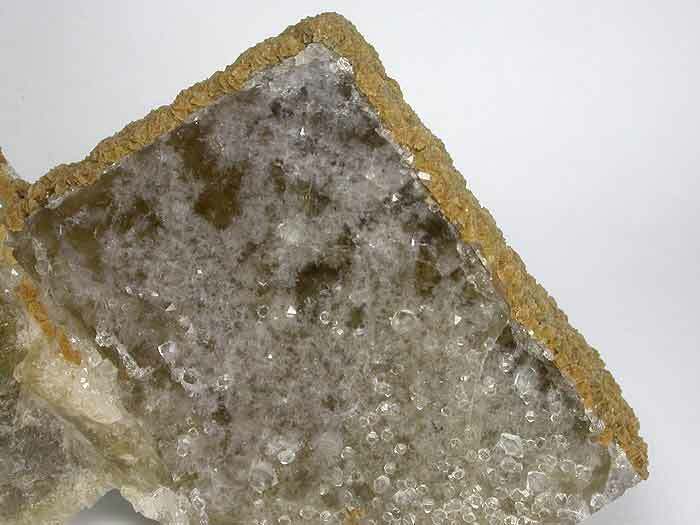 Dimensions 100mm x 70mm x 70mm Appx. 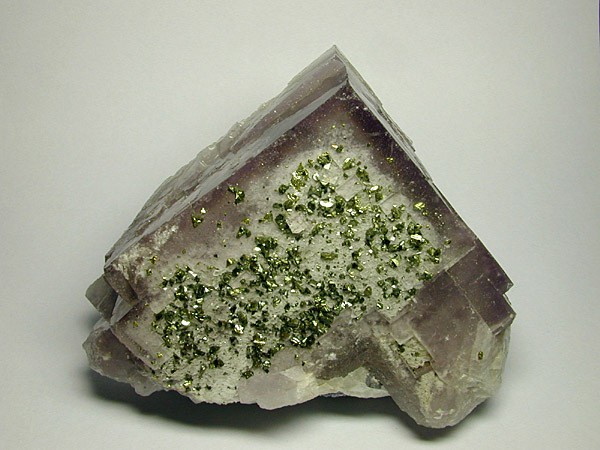 Fluorite with Chalcopyrite from Weardale. 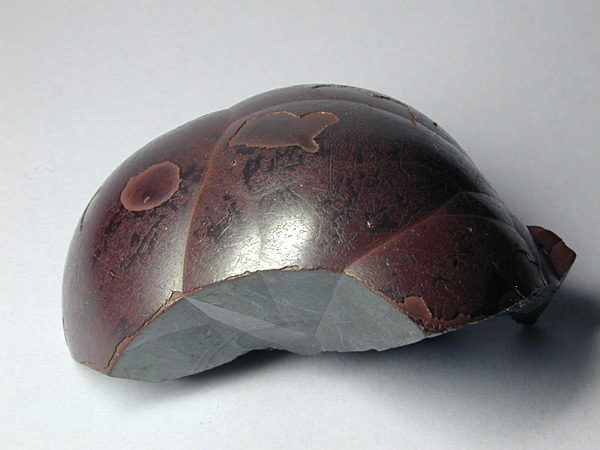 Origin Weardale, County Durham, England, U.K. 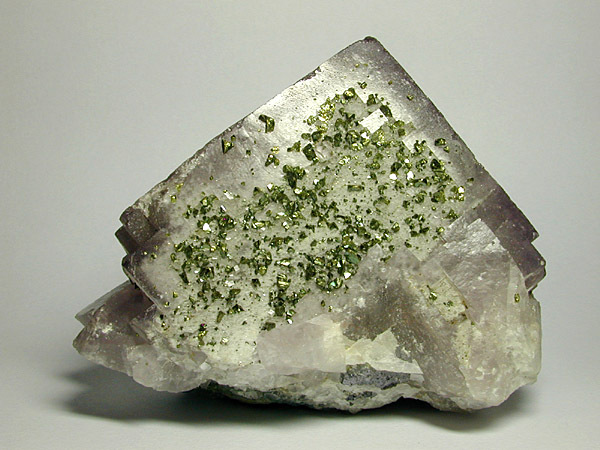 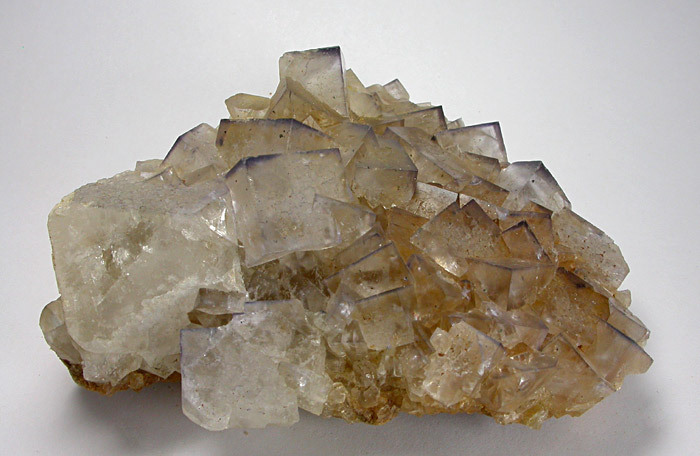 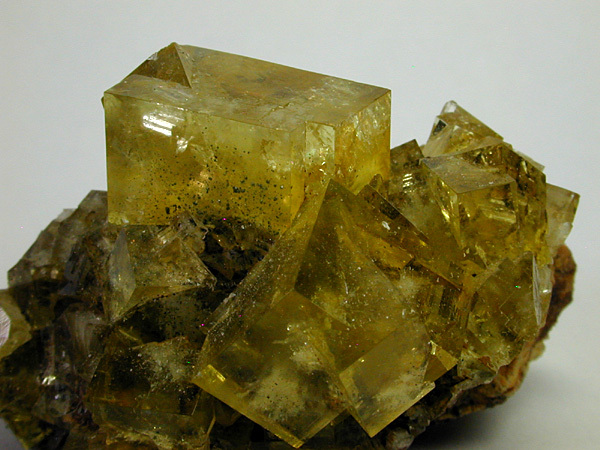 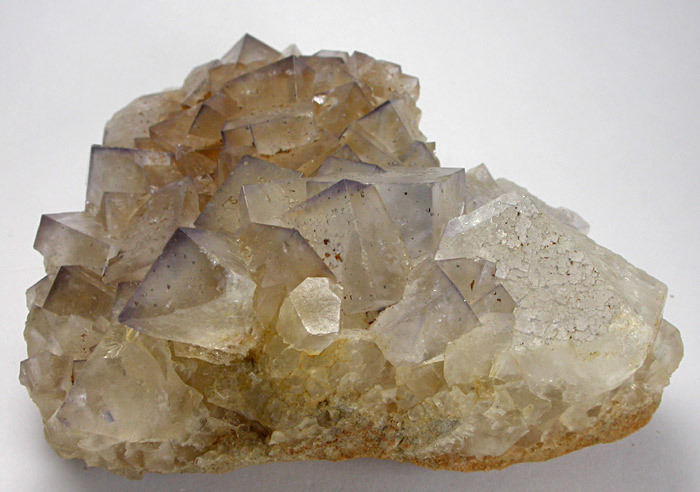 Section of a cube of pale violet fluorite partly coated in a "zone" on one surface with 2mm brassy yellow chalcopyrite crystals. 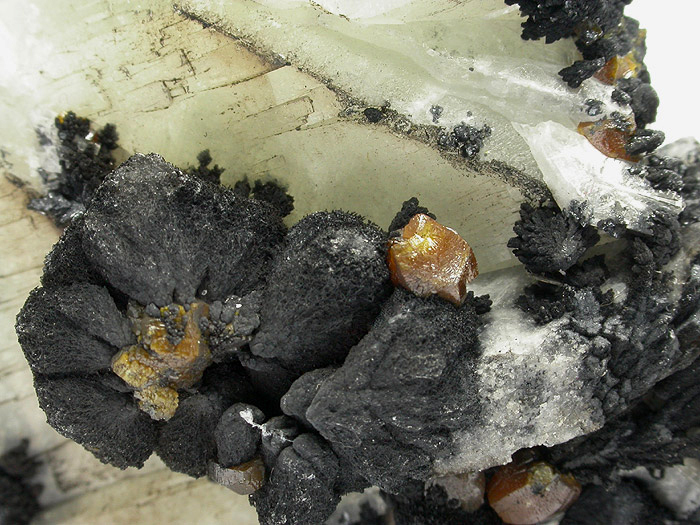 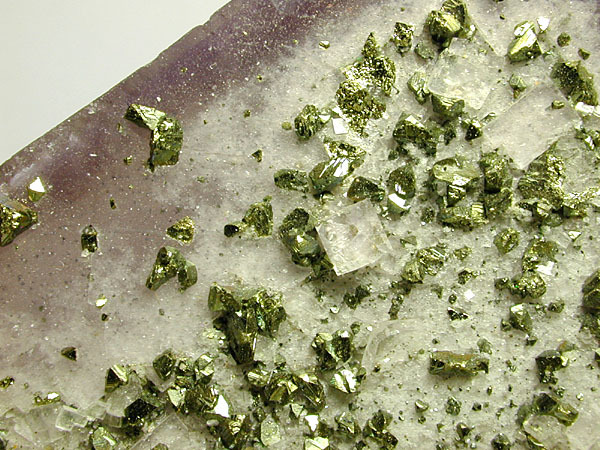 The greenish core can be seen on the reverse side of the crystal. 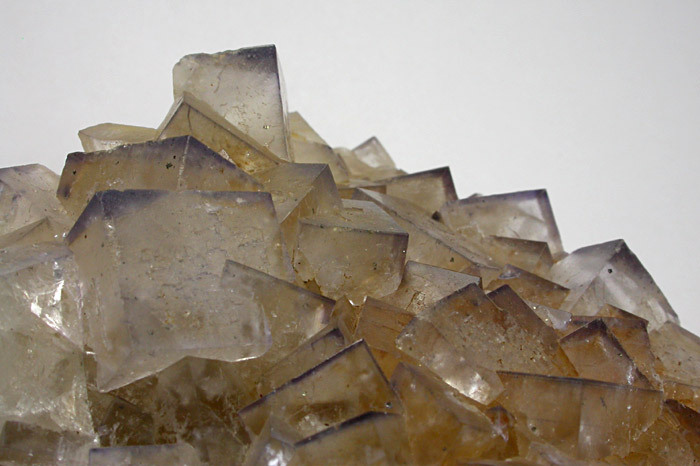 Dimensions 80mm x 70mm x 50mm Appx. 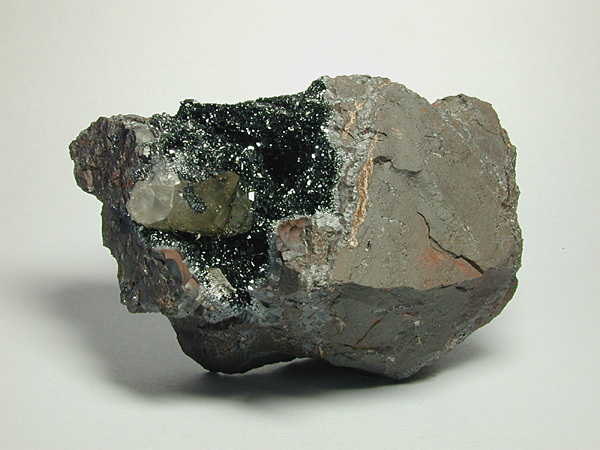 Origin Frazer's Hush Mine, Rookhope, County Durham, England, U.K. 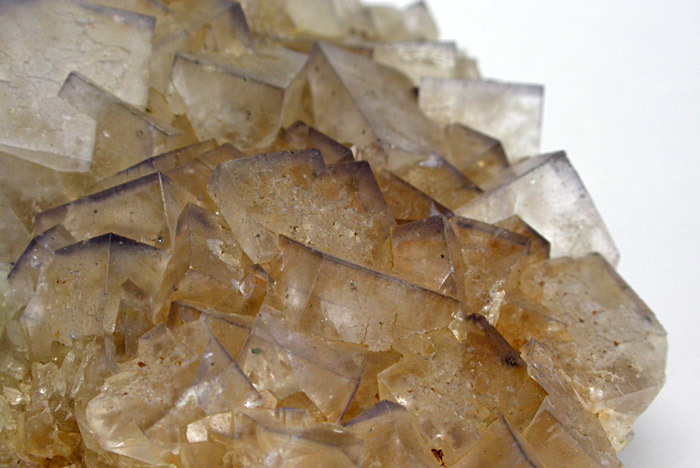 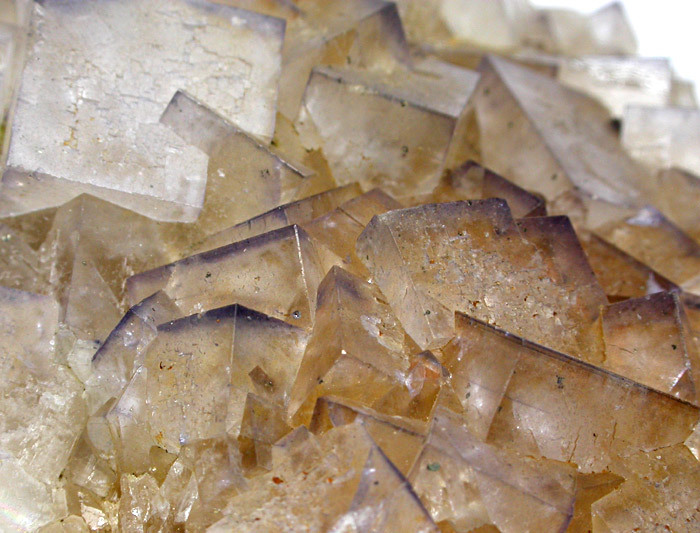 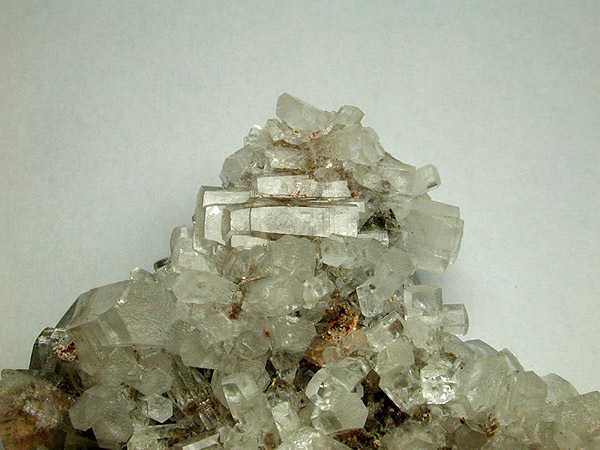 Description Nice group of water clear terminated prismatic calcite crystals on minor matrix. 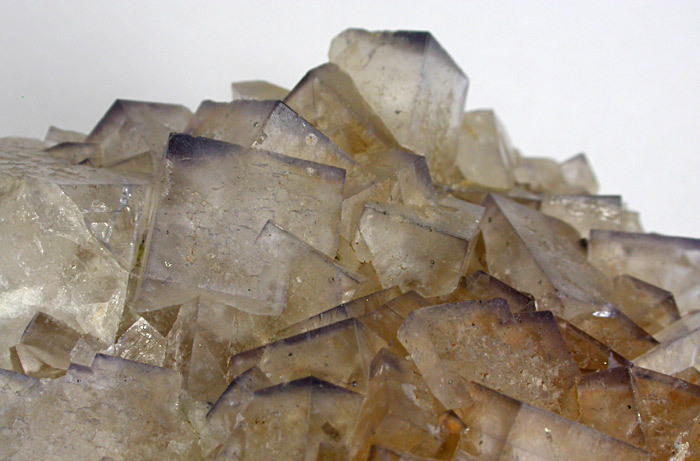 Dimensions 55mm x 50mm x 20mm Appx.